This short paper describes La’o Hamutuk’s projections of the lifespan of Timor-Leste’s Petroleum Fund, which were summarized in our 15 April 2015 article Timor-Leste’s oil and gas are going fast. It updates the baseline scenario from La’o Hamutuk’s Sustainability Model which was last published a year ago. Since that time, world oil market prices and Timor-Leste state spending have both dropped, with effects which approximately cancel each other out, so our overall conclusion – that the Petroleum Fund may be entirely empty in about a decade – is, sadly, still valid. After we published our April article, the U.S. Energy Information Administration (EIA) released its Annual Energy Outlook 2015, with updated projections for oil prices through 2040. Timor-Leste’s Ministry of Finance used these projections to revise its expectations of Timor-Leste’s oil and gas revenues, which were shared on page 28 of its presentation at the Jornada Orçamental budget workshop on 14 May 2015. The graph at right is revised from La’o Hamutuk’s April paper, showing the Ministry’s new revenue estimates and the green dotted line at lower right. Timor-Leste’s Petroleum Fund currently pays for about 90% of the state budget, but its $17 billion dollars will not last very long after 2020, when the Kitan and Bayu-Undan oil and gas reserves will be used up. La’o Hamutuk’s Sustainability Model synthesizes information about government plans, oil revenue projections, and other revenues and expenditures to estimate how long the Petroleum Fund will continue to exist. 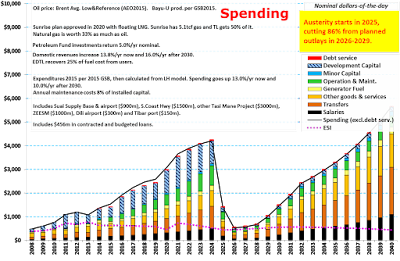 Using realistic, moderate assumptions, the model shows that the Fund will only be able to support Timor-Leste for five to eight years after Bayu-Undan runs out … until about 2025. Although this article describes only one scenario, the model can estimate outcomes from a variety of assumptions. 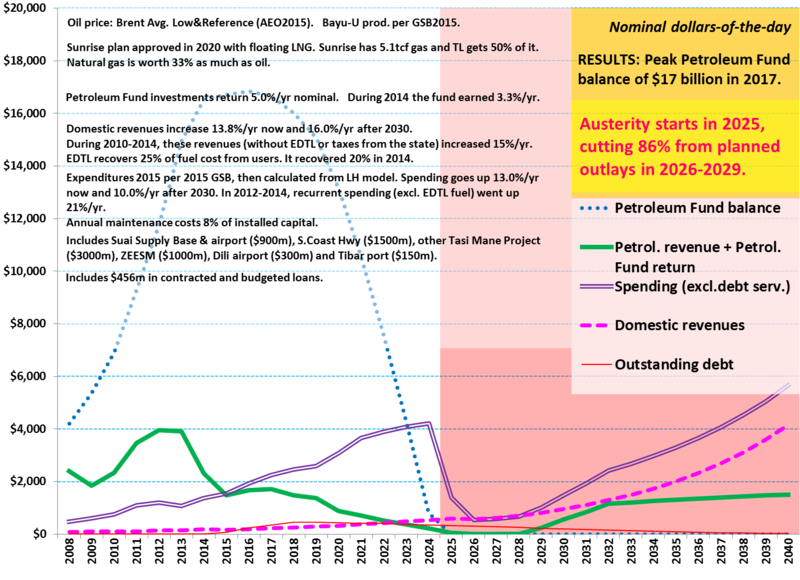 The graph at left is based on prudent assumptions for oil prices (the average of the EIA 2015 Annual Energy Outlook low and reference cases, the same as the Ministry of Finance uses) and Petroleum Fund investment return (5% nominal). However, it projects future state spending more realistically than the Ministry does by including estimates of total construction costs for large projects currently being planned, designed or built (see below), as well as more plausible projections for recurrent spending. This scenario assumes that the Woodside-led Greater Sunrise Joint Venture, Timor-Leste and Australia are able to agree on a Sunrise development plan, and that the oil and gas field will be developed as the companies currently prefer (with a floating LNG plant) and according to the 2007 CMATS Treaty (with upstream revenues shared 50-50 with Australia). If this does not happen, oil revenues may not resume after 2029, and the growing state budget that the graph shows after that date will not be possible. 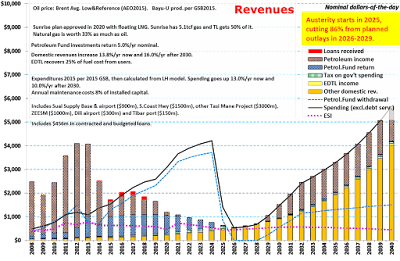 On the other hand, if Timor-Leste is able to get a fairer share of Sunrise revenues, or if the LNG plant is built in Timor-Leste, additional revenues will reduce the severity of budget cuts, but will still not be enough to cover 90% of desired state expenditures in the 2030s. The scenario also makes the overly optimistic assumption that non-oil (domestic) revenues will increase 16% every year from 2030 on, which is probably unachievable even with radical reprioritization of the economy and tax laws, especially after the severe cutbacks required when the Petroleum Fund runs out. However, this factor does not significantly affect how long the Petroleum Fund will last. If we drill down to explore revenues and expenditures in more detail, we see how much oil dominates state finance. The first graph shows sources of money, while the second shows what it will be spent on, and both show the dominant role of oil and gas revenues and the Petroleum Fund. The spreadsheet model which generated these graphs is complex, not fully documented, and frequently updated, so we do not publish every version. However, La’o Hamutuk could make it available to those who would like to examine it in depth, or to test different assumptions and scenarios. The numbers underlying the preceding graphs are at left -- click on the table to make them readable. Figures are in millions of U.S. dollars-of-the-day, not adjusted for inflation. Petroleum income after 2028 and ESI after 2020 include the Greater Sunrise field (gray). The list at right shows the contribution of a few very large projects to the “Development capital” expenditure line in the previous table. It only includes megaprojects which are discussed in the Government’s Budget Books, although we have estimated the cost to build each entire project, not only the first few years shown in the Books. This list does not include most roads, water supply, buildings, communications, future electricity or other investments, as these are done as multiple smaller projects. We assume that private investors (or private sector PPP partners) will pay for at least half of the capital investment in the refinery, LNG plant, Dili airport and Tibar Port. We expect that more megaprojects will be built than those currently planned and announced, but we have no data on them. 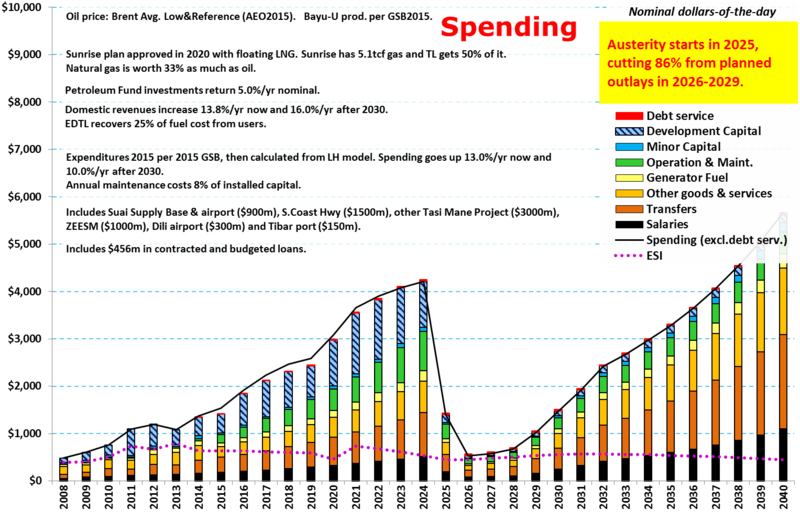 Their omission significantly underestimates future capital spending. On the other hand, cancellation of future ZEESM and Tasi Mane Project spending would prolong the life of the Petroleum Fund by two to three years and reduce the severity of subsequent austerity from 86% cuts from desired spending levels to 76%. Although Timor-Leste has been a sovereign nation for more than a decade, easy revenues from exporting nonrenewable oil and gas have financed the state without having to collect much tax from other sources. However, the neglect of economic diversification that this has enabled will have severe consequences within a decade, when the undersea reserves and Petroleum Fund will be gone. The results of this model underscore the urgency of more effective state spending and increased non-oil economic activities, both to provide revenues and to produce food and necessities for Timor-Leste’s impoverished majority. The petroleum windfall opened a window of opportunity for Timor-Leste to develop a sustainable, equitable national economy, but it is closing fast.